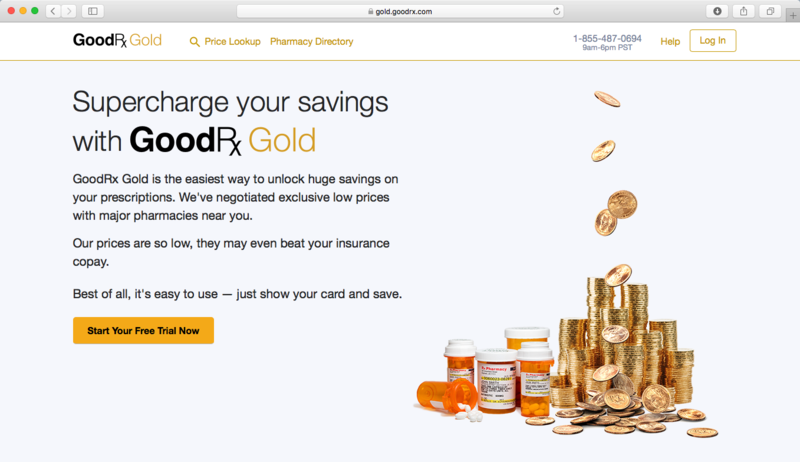 GoodRX Gold Review – How Much Can You Really Save? We are updating our review of GoodRX Gold again because they just made a very significant change to the service that we didn’t think would be possible. This specific change, it corrects the only real complaint or issue we ever had with GoodRX Gold. We honestly feel this new change to the service makes GoodRX Gold without question the best way for consumers to save money on generic prescriptions. We still encourage you to read our entire review, because it gives a very detailed look into how GoodRX Gold works. Also, reading about what was once our only complaint with the update below will also help give you more context into what is great about the service. Really quickly though, we want to announce what the latest news is with GoodRX Gold for anyone who is returning back for the update on this review. 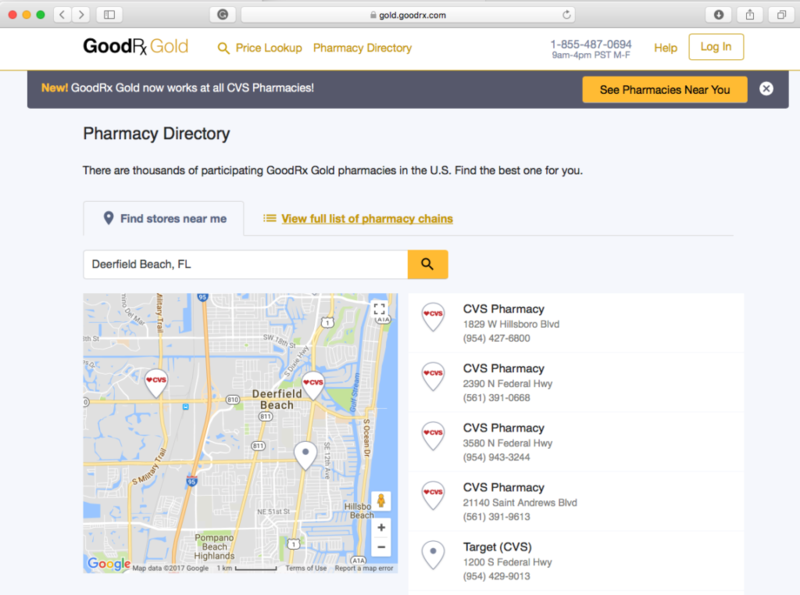 GoodRX Gold is now partnered with CVS Pharmacy! 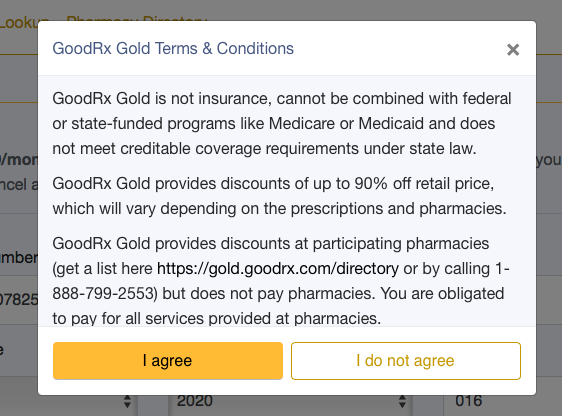 We didn’t think it would be possible, mainly because large pharmacy chains like CVS typically are not willing to discount prescriptions to the level at which GoodRX Gold requires. That said, we just got off of the phone with our contacts at GoodRX at it’s actually official, GoodRX is now partnered with CVS Pharmacy. 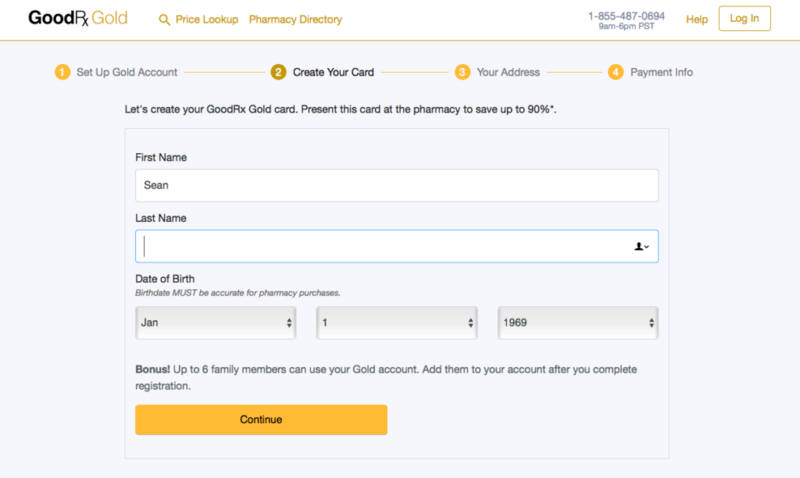 So now you can use your GoodRX Gold card at all CVS and Target Pharmacy locations. Okay, that’s it for the October 5th, 2017 update for our GoodRX Gold review. We’re excited to get into the latest with our detailed review of GoodRx Gold. We have been working with GoodRx for over two years now, and since then consumers have saved more than one million dollars on their prescriptions because of our own Prescription Savings Card that’s powered by GoodRx. We didn’t think it was possible, but GoodRx seems to have found a way to beat their already low prices on prescriptions with GoodRx Gold. Review Update Notification: After receiving some emails asking for us to give the GoodRx Gold an overall star rating from a fair amount of our subscribers, we decided to do just that. We typically don’t do star ratings on services, simply because our preference is to let people read the entirety of our reviews and then make a decision for themselves. That said, when people request we do certain things, we listen. So all that said, we give GoodRx Gold 4.5 out of 5 stars, and we’ll explain our reasoning for the half star deduction at the end of this review. At HealthNetwork we work really hard to connect with our members in a way where we are actually having a meaningful positive impact on their life with respect to health and wellness. Our goal is to be helpful in any way possible that improves an individual or families quality of life. It might sound corny, but all of us within the company have had our lives impacted in some way with healthcare. For some of us, a parent died young from a preventable or treatable disease, or a loved one passed away because they didn’t have access to the information they needed or the care that was required. 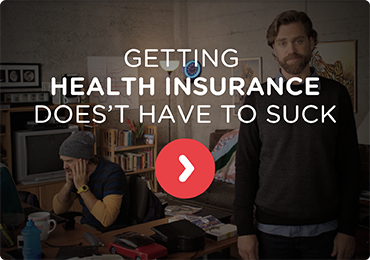 For others, a life event occurred that highlighted just how important health insurance is. For those reasons and many others, we really do try to go above and beyond each day. It’s not easy, healthcare is ridiculously complicated, politicized, and well we just can’t imagine a more difficult industry to work in currently. That said, we think it is worth it, because of how rewarding it is knowing that we do in fact have a positive impact on millions of American families lives every year. For the last two years, as part of our Gives Back program, we have been providing anyone who simply registers with us, access to our Prescription Discount Card. It helps reduce the costs of prescriptions for anyone at almost every major pharmacy in the United States. We partnered with GoodRx on this effort, and they provided our members with an exclusive discount, and any revenue opportunity that HealthNetwork could have received simply went to the consumer at the point of sale. It’s a complicated way of saying, we deferred making money from our discount card to save consumers as much as possible. Right now a lot of Americans are finding that their health insurance plans do not often cover their prescription costs, or those costs are covered only after they have met a pretty significant deductible. This can often mean that people don’t fill a prescription because of the cost, or because of the cost of their co-pay, which can be upwards of fifty dollars per prescription. That problem is precisely why we went out of our way to find a great company to partner with, one that actually cares about consumers, in an effort to make prescriptions more affordable. While we would always prefer to be able to provide the most benefit to consumers with our own HealthNetwork Prescription Discount Card, we take our responsibility to you the consumer seriously, even if it means that we have to promote a service that is better than ours. So without any more delay, let’s get to the real reason you’re here. GoodRx is a partner for many companies who are in the health and wellness industry or health insurance. They’re the behind the scenes third party partner who makes the discounts at point of sale happen. Well now we’re even more excited to announce something we think is even better. GoodRx is launching their subscription based service called GoodRx Gold. 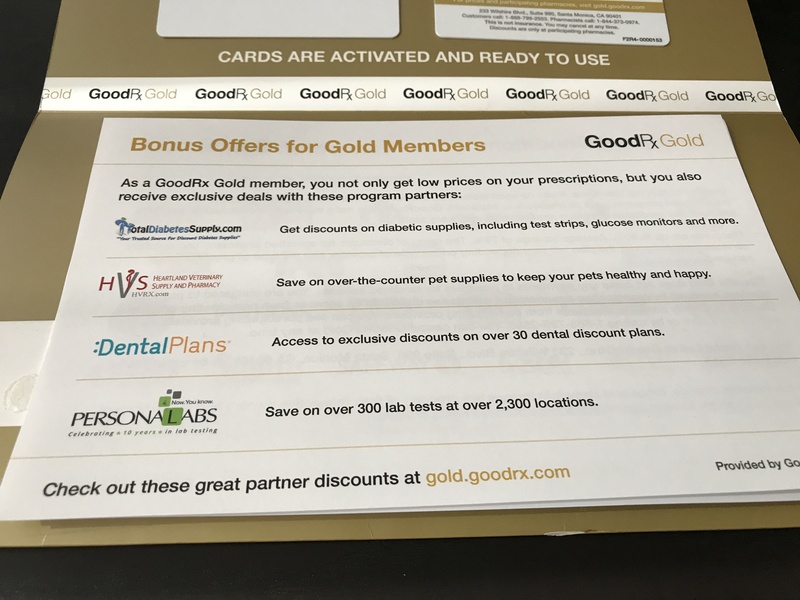 It is similar to their standard prescription discount card, or the HealthNetwork prescription discount card, but now with GoodRx Gold, there are even deeper discounts at specific pharmacies. There are two key distinct differences with GoodRx Gold, which depending on your prescription drug usage and requirements could mean greater savings and possibly a requirement to do a little extra driving. With GoodRx Gold, you can save almost 50% more off of the standard GoodRx rate pricing at participating pharmacies. Most often you are only going to see significant savings on generics. If you require specialty drugs or what are often referred to as “Tier 3 Drugs” or “brand name drugs” with insurance carriers, GoodRx can still save you money, just not as much. Standard On Pricing Makes Finding The Lowest Rate Much Easier – Typically you will find that GoodRx Gold will save you about $10 more per prescription than the regular discount card. HealthNetwork members have saved on average about $30 at point of sale, but that doesn’t mean there are overall greater savings with our card vs GoodRx Standard or GoodRx Gold. It’s all dependent on what pharmacy you use, and what prescriptions you require. 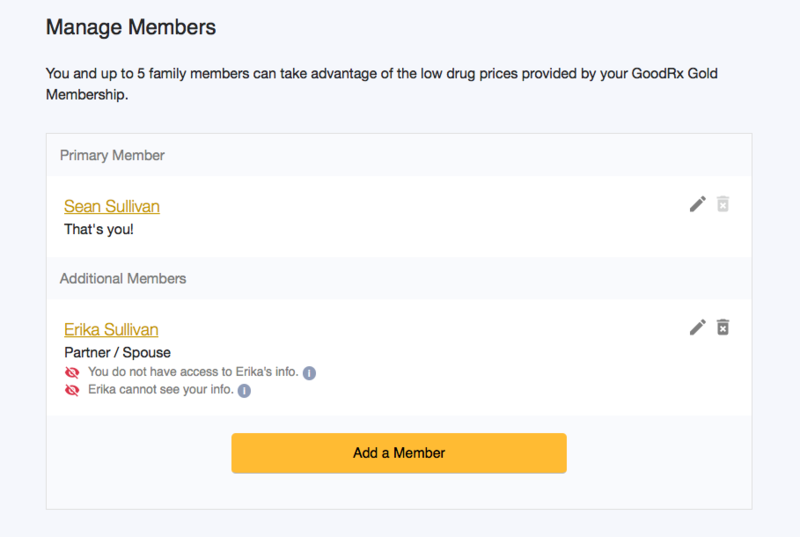 One GoodRx Gold membership is good for the whole family. You can add up to 5 more family members, and this even includes discounts on pet medications. So if “Buster” has a pricey prescription that helps with hip dysplasia, no worries, GoodRx Gold can be used to help reduce his medication costs. GoodRx has been able to partner with thousands of pharmacies in order to accomplish this goal of providing even deeper discounts from their already significant savings. Just some of the participating pharmacies include, Kroger, Albertsons and SafeWay. You can get a complete list of Participating GoodRx Gold Pharmacies here. Generic Pricing that is often less expensive than the cost of an insurance co-pay. For example, one of the most common prescriptions written is for Atorvastatin, also know as the generic version Lipitor. Under GoodRx Gold, 30 tablets of the 20mg pill would only be $5.60. GoodRx Gold is not a free service, unlike the standard GoodRx or the HealthNetwork Prescription Savings Card. It costs $10 a month, but for individuals or families who use a fair amount of prescriptions, you could save $10 or more from just one prescription. So how do you know for sure? Well, we’re going to help you calculate the potential savings in a little bit, but fear not, GoodRx is giving us the ability to provide you with a No-Stings Attached 30 day free trial to check it out for yourself. We know, everyone offers something like that. Here’s the thing about many services that allow you to try something out for 30 days. Cancelling is very often purposely difficult. 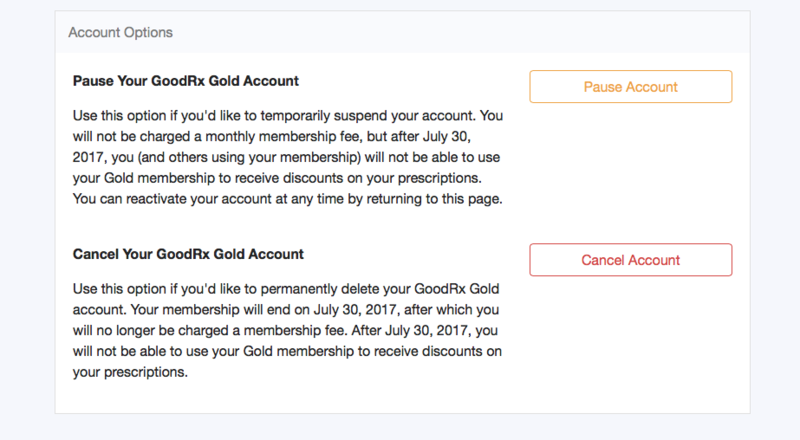 Canceling your GoodRx Gold membership, regardless if you are in the free trial period, or when you are a paid member, is very easy. It is intentionally easy. Pro Tip: That is actually one of the ways that you can tell if a service is a good one or not. If a company has a free trial or a money-back guarantee, but the process to cancel is like a scene from Mission Impossible, that is a big red flag. 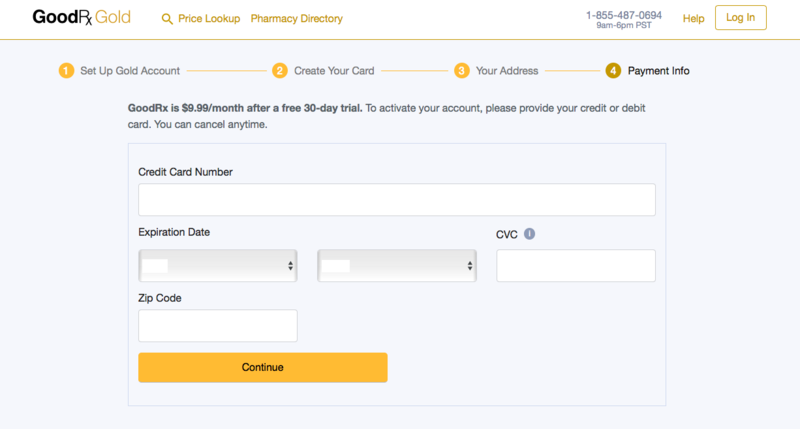 The process to cancel with GoodRx Gold takes literally 90 seconds. Why is GoodRx making it so easy to cancel? Why not make it difficult like other companies most often do? 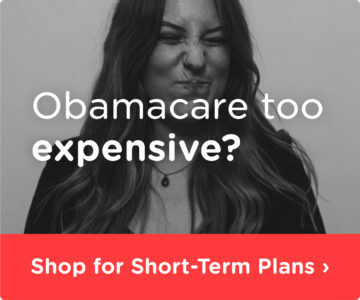 Because their service does what it is supposed to do, and at $10 a month, especially for families, you could end up saving hundreds of dollars a month on prescriptions from a single refill. GoodRx has very high renewal rates because consumers most often find a lot of value in GoodRx Gold. 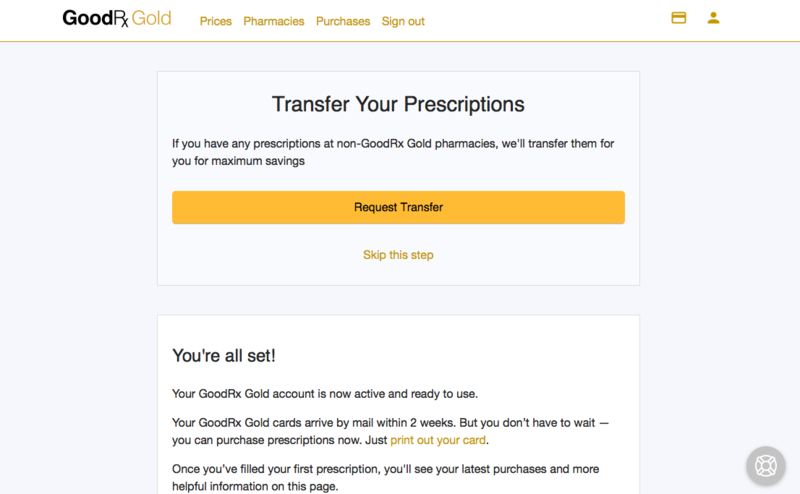 All that said, we’ll show you the process to cancel GoodRx Gold a little later in this review. This is a pretty short list, but here it is. Availability of drugs and available pharmacies to fill the prescriptions. A little background information, and or a peek behind the scenes of the pharmacy industry if you will. Here’s something you’re not supposed to know about the pharmaceutical industry. Regardless if it is a drug maker or a massive pharmacy chain, they are typically not big fans of companies like GoodRx. Why is that? Well, it’s complicated, but the short explanation is that companies like GoodRx bring transparency and easily accessible information to consumers about prescription drug costs. So what does this mean? It means that not all major pharmacies are going to participate with GoodRx Gold. It means that with GoodRx Gold, you might have to go a little further to get these seriously discounted prices. That said, depending on your prescription requirements, an extra five minutes of driving could mean saving hundreds of dollars at the pharmacy in one trip. GoodRx has been doing a ton of hard work over the years to get to this point there are at now where they have negotiated the lowest rates we have ever seen on more than 1,000 of the most commonly prescribed generic drugs. Often their pricing with GoodRx Gold is below a typical insurance co-pay. So before we take you through to see how the sign-up process works, and how you use the service to find the cheapest rate on prescription drugs, first let’s take a quick look at some real life savings we were able to compile. Note: We used Boca Raton, Florida as our test area. GoodRx Gold Savings Summary: Savings of 14% from standard GoodRx, about $1.50 isn’t too shabby. Not big savings over the standard GoodRx card, but it is certainly significant when compared to the cash price at Walgreens and Publix (grocery store chain). GoodRx Gold Savings Summary: Savings of about 40% from standard GoodRx, good for a few bucks. Again not big savings over the standard GoodRx card, but it is an eye-popping difference between the cash price from Public and Walgreens. Interestingly, CVS cash price on the specific prescription was very low. Still overall GoodRx Gold won this match up. GoodRx Gold Savings Summary: This time we found a savings of about 50% from standard GoodRX, which was just over $15.00, not too shabby. More interesting though, is the thought of having to pay the actual list cash price without GoodRx at all. Crestor (and its generic) are one of the top 10 most prescribed drugs nationwide. It didn’t matter if you were paying cash at CVS, Walgreens or Publix, without GoodRx or GoodRx Gold, this prescription would set you back $200 or more. That’s an incredible amount of savings! Without question, the pricing we’re finding with GoodRx’s prescription formulary for generic drugs is lower than pricing anywhere else. We’ve checked more than one hundred drugs so far, and while we are sometimes finding that there are in fact some drugs in which there is not a significant discount, more than 80% of the time there is at least a 10% difference in price. Sometimes GoodRx Gold can lead to a discount of upwards of 90%. We’re certain there are probably some other generics out there where the costs could be lower, but right now it’s few and far between. There are always outliers, that said we believe that overall, for the most commonly prescribed generic prescription medications, GoodRx Gold will save consumers the most money. So what can GoodRx Gold do for non-generics? Well again we think that people will get the most benefit on generic drug pricing, but let’s take a look at an example of a premium Tier 3 prescription and its cost with and without GoodRx. So let’s take a look at GoodRx Gold and what it can save you on some well known high priced prescriptions. If we want a well known, or often written about and outrageously priced drug to test GoodRx Gold with, let’s look no further than Harvoni. It is used to treat individuals with Hepatitis. It’s a bit unusual in that it is a prescription drug treatment that someone really only takes once in their lifetime. It is used in effect to cure an individual of a specific type of hepatitis. So aside from the cost of developing the drug, and the marketing of it, which is all factored into what it is sold for, it’s also a prescription that individuals don’t take for the rest of their life. So it makes sense that this is one of the most expensive prescription drugs on the market currently. So that brings us to the real life cost of Harvoni, a whopping $87,800 according to CNBC article from May of 2017. When we checked pricing with CVS, Walgreens and Public the costs were lower, but still unaffordable. Here’s a breakout of the costs with and without GoodRx Gold. 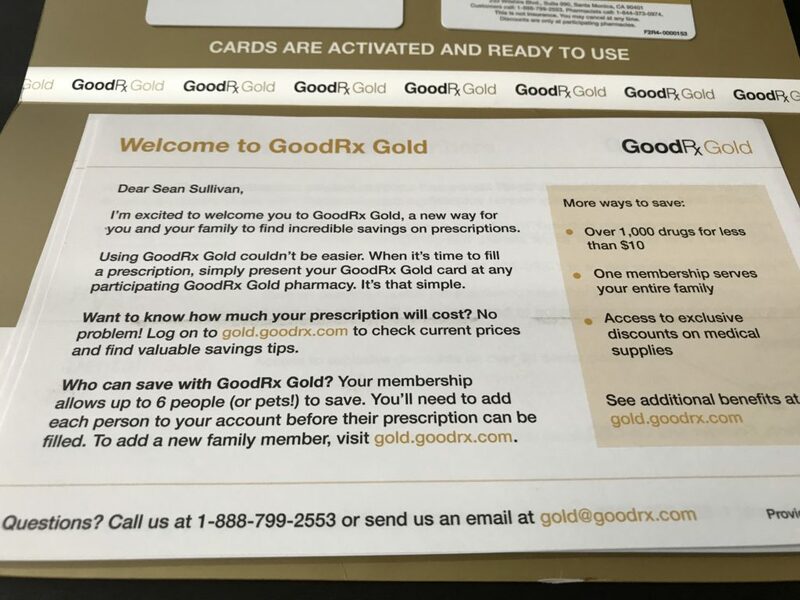 GoodRx Gold Savings Summary: So hopefully no one has to purchase this prescription drug completely out of pocket because the costs are incredibly expensive. GoodRx Gold will save you about 5%, which is about about $2,000 compared against all other options. 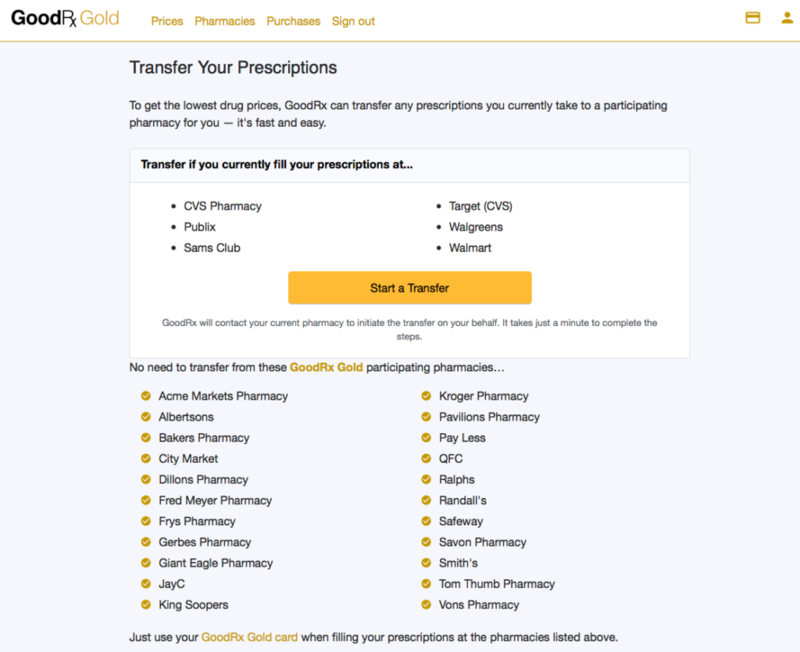 So now that we have established that GoodRx Gold is, in fact, a great way to save a substantial amount of money on your generic prescription drugs, let’s explore what the sign-up process is like. GoodRx gives you a legitimate free-trial offer for 30 days, so this is very much a completely risk-free offer. That said, and we touched upon this before, canceling GoodRx Gold should it not be a fit for your needs is extremely easy. You simply navigate to the account settings section of your account where you will then have two choices regarding your account. You can keep it live as is, cancel it, or pause your account. So fear not, should you not find value in the GoodRX Gold service, canceling takes literally 90 seconds. So now that we covered how you cancel your account, let’s review the sign-up process. GoodRx Gold has a very similar sign-up process to many other services that you are accustomed to using for the most part. Name, address, email, phone, they’ll need the basics to get your billing set up. We didn’t try out signing up with Google+ or Facebook, but we’re certain it is a functioning option. Please note that some images in this review will have details removed for privacy purposes. When you sign-up with GoodRx Gold your screen will not have anything obscured. Below you’ll find the billing account information section of the sign-up form. What would any online service be without a Terms & Conditions policy for you to read through? Our legal department has actually read it, and there is nothing within that is a concern for us, it is all standard terms of service language. After you click I agree, that’s it, you are then taken into your account to manage it directly. From there you can then decide to add additional family members. 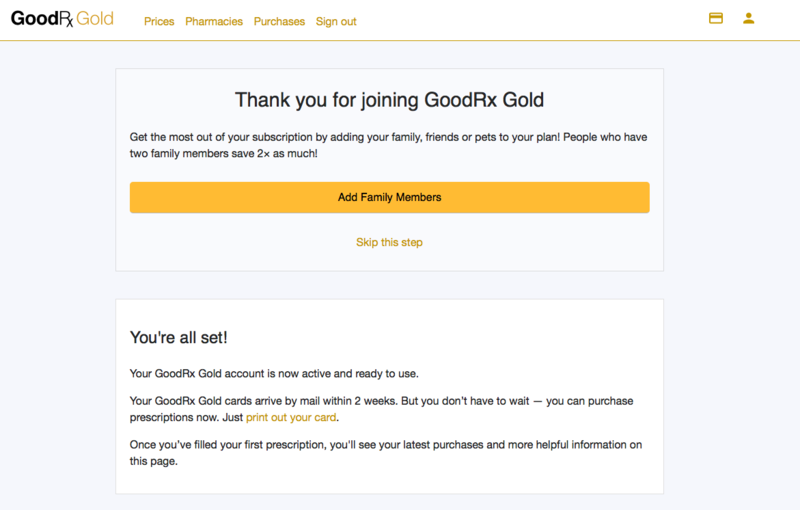 In the example below, we have added a spouse to this GoodRx Gold account. The age and other sensitive information have been removed. Please note one very important option within GoodRx Gold’s setup. 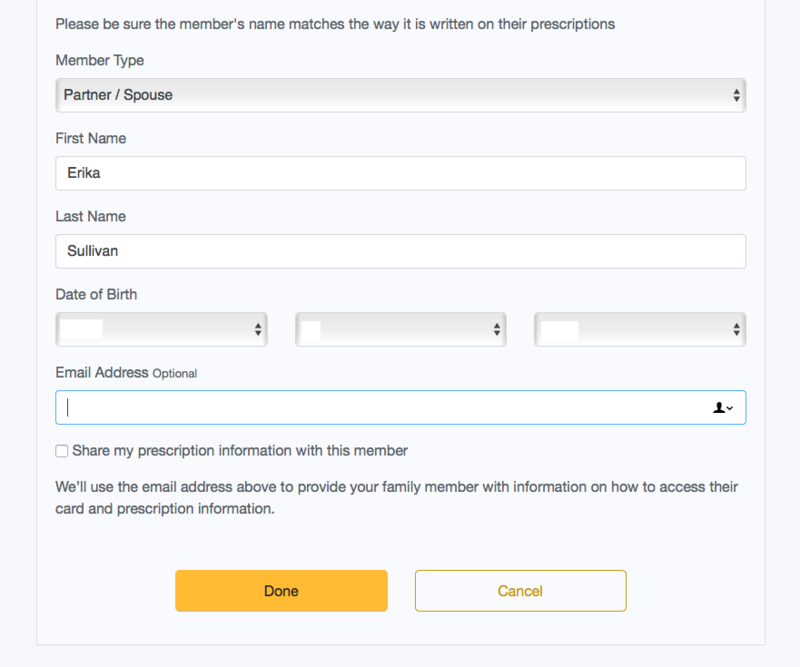 When adding another party to the account, (in the example below a spouse) you have the option to share your own prescription information with that member. It is very common that spouses or partners share rights with one another that give them the ability to pick up prescriptions for each other or access purchasing information at the pharmacy. 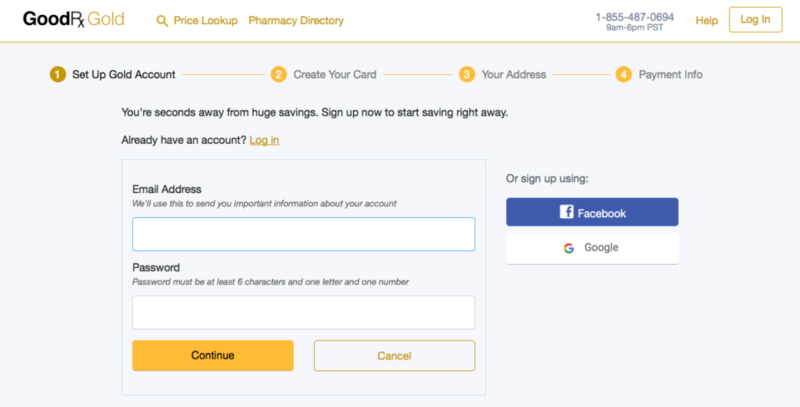 Anyone who is added to the account will have to log in and provide the original account holder with permission to access their GoodRx Gold profile as well, should they decide to enable that feature. All around these are great privacy and security measures. 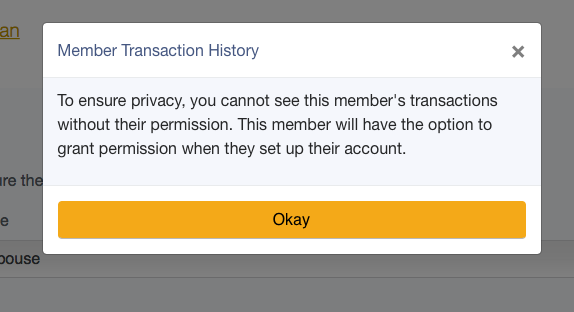 Once you have completed adding someone another party to the account, you will see a screen that provides information about each individual and the permission levels that they currently have. In the example below, we are using HealthNetwork’s two Co-Founders, who happen to be married in real life. Unfortunately (or fortunately) neither currently take any medications that could have been used for use in this review. Each GoodRx Gold account is good for up to six family members, and that includes the four legged variety as well. GoodRx Gold can be used for medications for family pets as well. You go through the same registration process as above, even if it’s for a dog. You will be mailed out a physical version of the GoodRx Gold Card, it will arrive within a few weeks. In the interim you have the option to print out a temporary card, have a digital version of the card sent to you, or you can have it emailed as well. Printing out a temporary card, pictured below, is a snap. Or you could always have a text message with the information that will be required at the pharmacy, sent directly to your mobile phone. Below is exactly what you will receive via text message, just with your own account information. 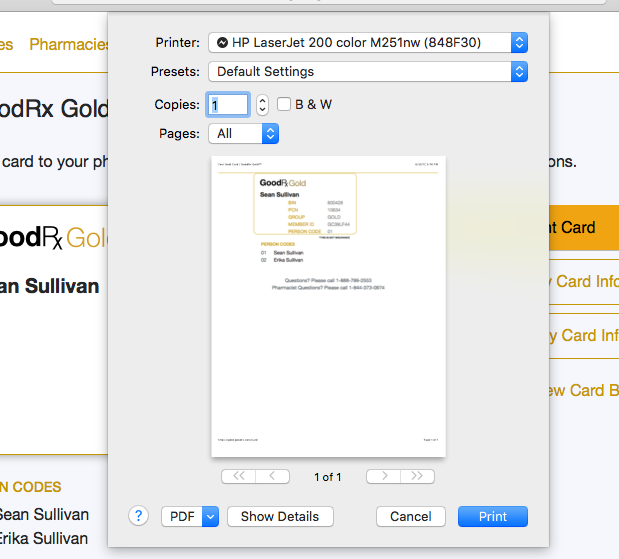 GoodRx Gold Pro Tip: Here’s a quick tip if you prefer to not have to carry anything around and simply rely on a digital version of your card. 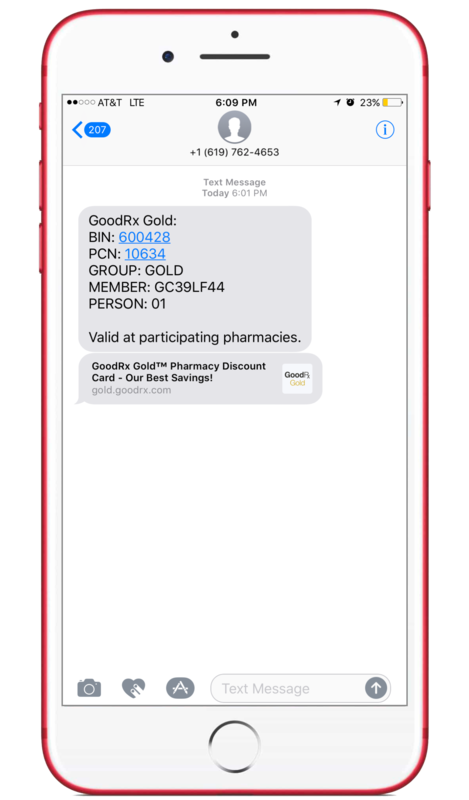 Create an image of your GoodRx Gold card, then save that image as a contact within your phone. You could also save the text message that you receive from GoodRx as a contact as well. 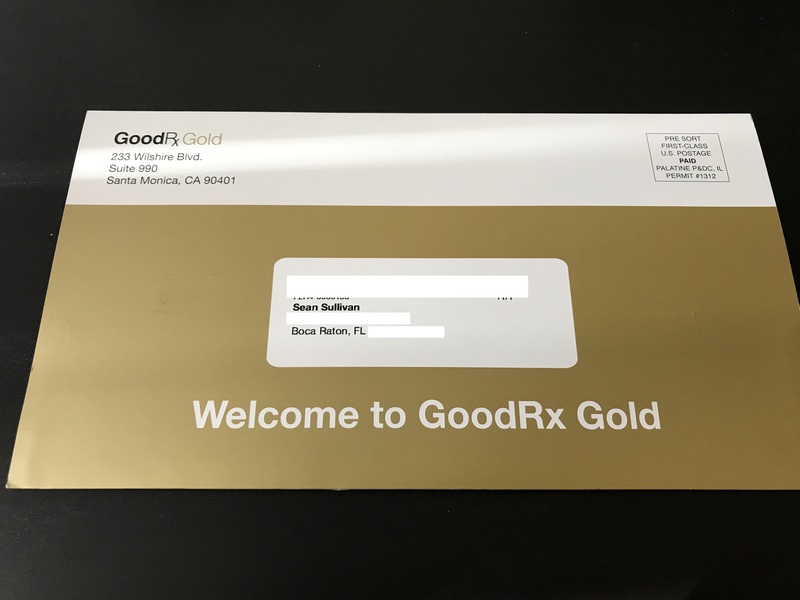 Wondering What The Physical GoodRx Gold Card Looks Like? So within ten days you’ll receive your GoodRx card in the mail. Ours took a little less than a week to arrive. A couple things that we like about the physical card, and the rest of the stuff you receive from GoodRx Gold in the mail. So first everything arrives in nice packaging, which maybe this doesn’t matter exactly, but in our experience companies who take pride in their product and presentation, they typically end up being a better company to work with. Above is the professional mailer that everything arrives in. Inside you’ll find your GoodRx cards, and some additional perks. Next let’s discuss the physical GoodRx Gold card that you’ll find inside. Here’s something that we’re much more focused on, the physical card itself. The quality of the card is in our opinion, perfect. 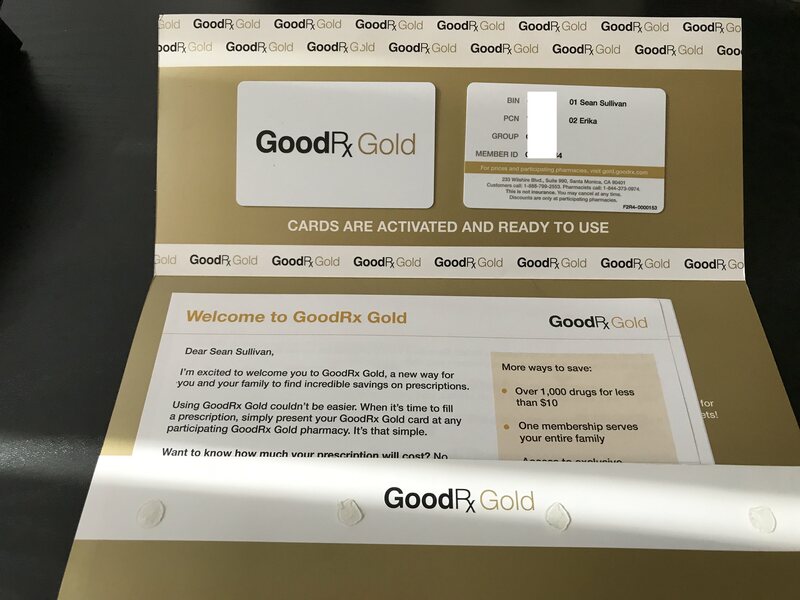 The GoodRx Gold Card is made of high-quality plastic and while the thickness isn’t the same as with a credit card, we think that’s much more practical. You’re not using the card as often as a debit or credit card, so it doesn’t need to be as rugged or thick as a credit card. It’s smooth to the touch, thick enough so that it is sturdy and not going to look terrible after being in a wallet or purse for months. Overall the thickness of the card is right in line with a hotel key, but the quality and printing are substantially better than what you would find at a hotel. Also, for whatever reason the overwhelming majority of prescription discount cards out there look kind of cheesy, to put it nicely. A lot of them have designs that make it look like a coupon clipping service. Or just overall the feeling they evoke might be that you’re using some kind of government assistance card to help pay for your prescriptions. Some people are very sensitive about these kinds of things, and that’s fair. GoodRx, with both of their prescription discount cards, have wisely avoided that kind of card design. Taking it one step further with the GoodRx Gold card, they go the opposite direction with the card design. It’s slick and simple, and it evokes a feeling of status or exclusivity. There is no chance that anyone who is in line with you at the pharmacy would see you pull out the GoodRx Gold card and think it’s associated with any sort of government subsidized healthcare program. Is this a really critical thing, no it is not. That said, again in our experience, the level of thought and effort that a company places into every detail of their product or service, is often very indicative of the quality of that company. Next, let’s talk about the extras that come along with your cards. First, there’s a nice intro letter, complete with a personal message from the Co-Founder of GoodRx. It’s a nice touch and again, when companies are transparent about who they are, and who the people behind the company are, that’s a good thing. Doug, one of the founders is often in GoodRx commercials and he’s very visible in everything GoodRx does. We think that’s about helping create and establish a long term relationship with consumers, not about ego. It’s nice to see that followed through here with the letter that’s sent out with your cards. Below is a GoodRx commercial with Doug as well. Here’s the front side of the letter they send out to you. Finally, one other benefit is that they’ve included a list of partner company offers that some of which are actually really good. Often companies do cross promotional marketing more so for revenue than anything else, and the offers that are extended not always really applicable. That’s not the case here, and another example of their thoughtful process, since you can, in fact, use the GoodRx Gold card to save on pet medication, they’ve included a pet supplies partner. Where Are GoodRx Gold Pharmacies Near You? 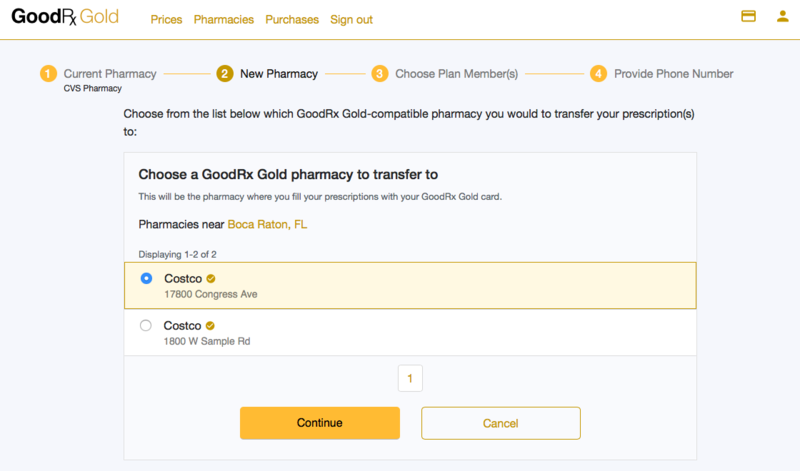 Finding pharmacies that are participating with GoodRx Gold is very easy. 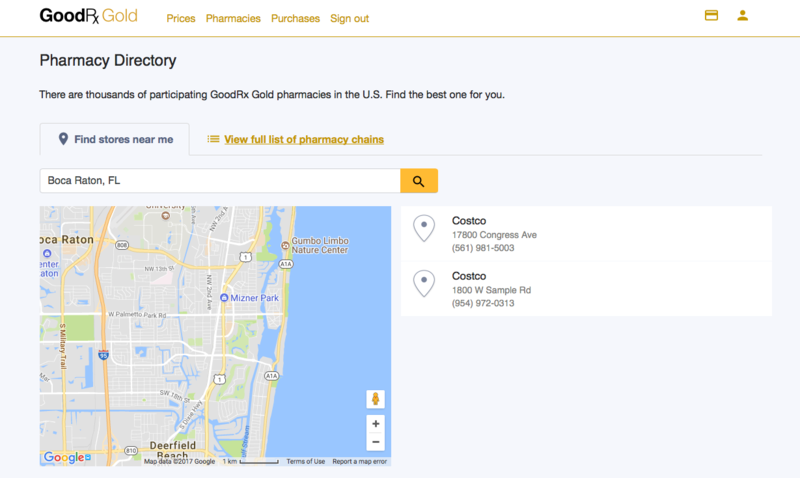 Simply click on the link that says Pharmacies and from there you will be able to enter your zip code to find a pharmacy near you that is participating with GoodRx Gold. Again, GoodRx has done a very good job of making the process of navigating around on their website very easy. 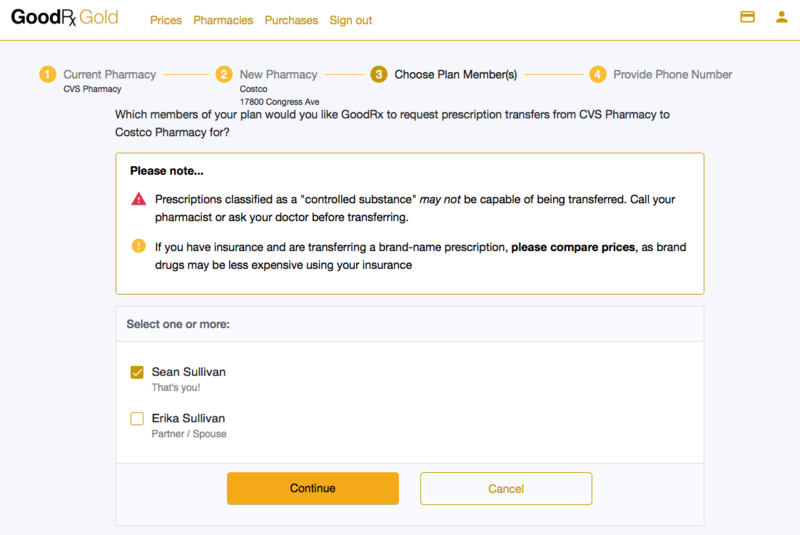 From the main account screen you will see an option listed at the bottom of the page that pertains to transferring a prescription. Simply click on that link to start the RX transfer process below. After clicking on Start A Transfer button you will be given the ability to transfer in from all of the following pharmacies. From there you then select one of the available participating pharmacies within close proximity to you. There’s a disclaimer regarding controlled substances prescriptions. Unfortunately our test subjects don’t actually have any current prescriptions, but this is what the process is like. Then you simply complete the process, which requires you provide your contact information, and there is an area where you can add a specific note regarding any of the prescription transfers. We’ve been a fan of GoodRx, its founders and executive team for years now. HealthNetwork being a consumer centric company, we are honestly relieved when we are able to work with a company within healthcare that actually makes the decision to put the customer and their experience first and foremost. While we are not privy to everything there is to know about GoodRx the company, we can speak to our own experiences, and those of the consumers who rely on us for help with their health and wellness on a daily basis. Our experiences with GoodRx and their services have always been positive. GoodRx, the free version is excellent to begin with. Our own HealthNetwork prescription discount card, that is powered by a custom contracted formulary, is another great option. GoodRx Gold without question offers the largest discounts that we can find on generic prescriptions. While the service does cost $10 a month, that is a very small amount of money to pay for savings like this. Obviously, if you don’t use a significant amount of prescriptions on a monthly basis, and you can’t realize a savings of more than $10, then it might not make sense for you to sign up. That said, with how things work these days with respect to health insurance plan coverage, statistically there are far more consumers within the United States who can benefit from this service, than those who can not. Hey, don’t take our word for it, see for yourself. You can use the link below to not only gain access to the service 100% free of charge for 30 days, but you can also price out prescriptions to see what the actual savings are before you sign up. To make things even easier for you, we’ve included a handy table that breaks out the most commonly prescribed generic drugs, and what their costs are with GoodRx Gold. Another great thing about GoodRx, is their transparency on pricing with their drug formulary. This means that you can quickly see what drugs are available for $5 or less, $10 or less and finally $20 or less with GoodRx Gold. We plan to update this post with additional information that breaks out the exact savings difference between GoodRx Gold, Regular GoodRx and what the average price is without either, cash pricing. The folks at GoodRx were also nice enough to provide us with an official formulary chart for some of the most often prescribed drugs that GoodRx members receive discounts on. If you and or your household, including pets, use a lot of prescription drugs, or even if the volume taken is low, but the out-of-pocket costs are high, then yeah you should probably take a very close look at what GoodRx Gold can offer you with respect to savings. Thanks to the easy to understand prescription drug formulary above that GoodRx provides, determining how much you can save should be a quick and easy process. Overall we think that with respect to all of the different companies out there who offer a similar service, there’s just no comparison to GoodRx. Be it their low pricing, the thoughtful manner in which they operate, the low cost for the GoodRx Gold Card, it’s all great, so take your pick of what you appreciate the most. Above all though, for us at HealthNetwork we’re fans of GoodRx because they consistently make choices that are always about what is best for the consumer. That’s incredibly difficult to do within healthcare, and we can speak from our own experience on the matter. That’s why GoodRx, and GoodRx Gold, is a company and service we fully endorse and support. Overall we give GoodRx Gold 4.5 out of 5 stars, a nearly perfect score. So what’s our reasoning behind this? Well the main drawback, or only real negative that we could find with GoodRx, is that you will possibly have to travel a bit further than usual to find a participating pharmacy. GoodRx has managed to convince thousands of participating pharmacies to in effect sell their prescription drugs to their members at cost. This is unlikely to ever be something that the pharmacy juggernauts like CVS and Walgreens will want to participate in. Now you might think that CVS and Walgreens, or Target Pharmacy (CVS) not participating might be a big deal and a major drawback for the service. Here’s why we do not think that is the case here. GoodRx Gold is specifically designed for individuals who fit two requirements, one they use a significant amount of prescription drugs on a monthly basis, and two, they’re mostly generic drugs. We noted at the beginning of this reviews October 5th, 2017 update, that GoodRX Gold is now partnered with CVS Pharmacy. This addresses and fixes our only complaint about the service, which was limited access to participating pharmacies for certain parts of the country. That is no longer an issue for GoodRX Gold and its members. I guess we sort of owe CVS an apology as well, since we did say that it was unlikely that a pharmacy juggernaut like them would ever participate with a discount program like GoodRX Gold. Sorry CVS, our bad. We’re keeping the 4.5 out of 5 Star Rating intact for right now, because, well we don’t have a good reason. Nothing is perfect, but we really can’t find anything to complain about with GoodRX Gold at this point. That said we have never given a 5 out of 5 Star Rating to anything, yet, and the idea of doing it makes us itch. Yes that sounds ridiculous, but if you haven’t noticed by now, we’re not exactly your average healthcare company. In closing, if you use a lot of meds, and they’re mostly generics, you could save hundreds of dollars a month with GoodRx Gold, possibly thousands. If you don’t spend that much on prescriptions, the regular (free) version of GoodRx is probably just fine.